Source: Prague Cathedral Archive, Prague. Also ms of the Credo, from the Dresden Sächsische Landesbibliothek. A complete mass setting for four voices, strings and continuo, which includes the Credo in F and Crucifixus for 8 voices. 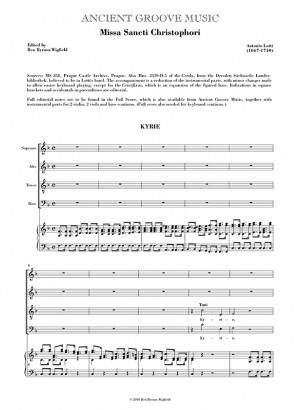 The figured bass has been expanded to provide an editorial right hand keyboard part. Lotti's mass settings are exclusively Kyries, Glorias and Credos. 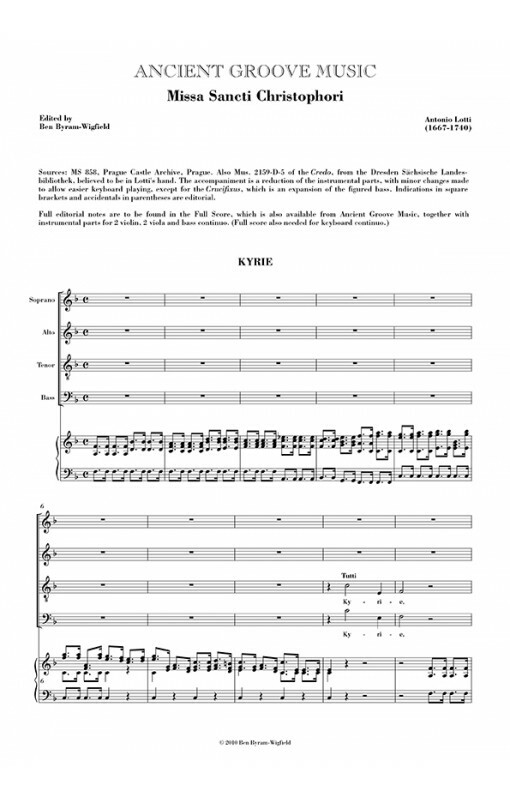 The practice of setting lengthy, musically complex and ostentatious music for these sections of the mass is typical of Italian church music, leaving the Sanctus, Benedictus and Agnus Dei to be performed as plainsong. In this work, the music of the Benedictus and Agnus Dei reprises material from earlier sections of the mass. It is probable that this was done by Jan Dismas Zelenka, who often produced 'gestrechten' complete masses from incomplete settings by other composers. It is not known whether the Sanctus is similarly reprised from some other setting by Lotti, or is by Zelenka. The Kyrie, Gloria and Credo are found individually in other manuscripts, ascribed to Lotti, and their authorship is not in doubt. Performers will require 2 full scores: one for the conductor and one for the keyboard continuo.